Achilles tendonitis is a condition that affects the back of the heel on the foot, where the Achilles tendon is located. The Achilles tendon makes the connection between your heel bone and it plays major parts in walking, jumping and running. As the largest tendon in the body, it can withstand lots of stress. However, the Achilles tendon can also be affected by a condition called tendinitis, which occurs when it is overused and begins to degenerate. Some of the symptoms include irritation, swelling, and pain of the area toward the heel of the foot. Fortunately, some of this discomfort can be alleviated with the right shoe. 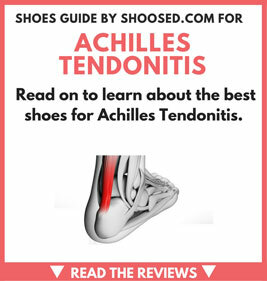 Read on to learn about the best shoes for Achilles Tendonitis. There are a few different reasons that the EM Road H 3 for men are excellent shoes. First, the thick rubber sole and E-MOTION midsole reduce impact to the foot, as well as the Achilles tendon. It also offers a good balance of cushioning and stability, which is important for someone with this condition. Unfortunately, this shoe also has its drawbacks. It does support a high arch but that may or may not be a bonus depending on your foot shape. Additionally, while this shoe is great for dry conditions, you will find that your shoe quickly becomes wet if you are walking across a wet surface. Verdict: If you need a good amount of arch support, this shoe will work well. It is comfortable, but rigid enough to offer support. It also reduces impact felt in the foot. This shoe by New Balance features ABZORB SBS, which is a type of non-cellular elastomer that does wonders when it comes to reducing impact, which is of particular importance. The shoe is also rigid and supportive, but still flexible, which helps keep you on your feet. Another reason that this shoe is ideal for people with ruptured achilles tendon is that it feels nice around the heel and provides excellent cushioning. The major downside of this shoe is that it could be considered heavy and clunky, depending on your preference. Verdict: This shoe is a great choice, depending on your activity. If you are doing something that requires a lightweight shoe, it is not the best option. Otherwise, it is incredibly comfortable and provides excellent shock absorption and support. The first benefit of this shoe that makes it an excellent choice is the Infinity Wave, which is a unique, full-length plate that directs the force of impact away from your feet when you run. The Wave Prophecy also features a very flexible sole that is ideal for running and a midsole made of AP+, which is a copolymer that is lightweight and bouncy. Finally, the mesh outside provides support without being too rigid. The one downside of this shoe is that some people found the toe box was too tight. It may not fit everyone like a shoe should. Verdict: Unless you require a large toe box, this shoe is an excellent choice. The unique design and Infinity Wave plate help to relieve the pressure and pain you may feel with the wrong shoe. Like the previous shoe on this list, the New Balance Women’s W1080v2 features a full-length board to reduce impact and increase comfort, called the ABZORB Strobel Board. This shoe fits a wide range of feet, because it has a comprehensive design that will not crunch your toes but also features a unique lacing system and mesh design that helps to stabilize your foot. The final benefit is that the light, flexible outsole provides cushioning and support but still bends with your feet. For some people, this shoe does not have enough arch support. You can fix this with an orthotic insert if you find it to be a problem. Verdict: If you find that this shoe does not offer the arch support you need, you do have the option of adding an orthotic insert. Otherwise, it is lightweight, supportive, and offers the comfort that you need. There are a few features of the Men’s Barricade 6.0 shoes that make them the ideal shoe. First, the shoe features an EVA insole. This insole molds to your feet to create a stable environment while providing cushioning to lessen the feeling of impact. Another feature that makes these shoes an excellent choice is the adiPrene heel insert that increases comfort around the heel and ankle area. They are also nice and grippy, so you do not have to worry about slipping while wearing these shoes. Another cool feature of this shoe is that the outsole comes with a 6-month warranty. It is nice to see a company that stands behind the quality of their product with a guarantee. As far as disadvantages, this shoe has two. First, they are a little heavier than some of the other shoes on this list. This may or may not be a disadvantage, depending on how you are using them. Second, they are rather stiff. They will break in some once you use them but some people still find that they are too rigid for their preference. Verdict: The adiPrene heel insert and EVA insole make this shoe incredibly comfortable for a lot of wearers. If you can look past the weight of the shoe and the potential rigidness, then it is definitely a shoe that may alleviate some of your pain. The 6-month warranty on the outsole is also a benefit. This shoe has quite a few benefits for people struggling with this disorder. First, the midsole is made of DuPont Elvaloy material. This material conforms to your sole to provide a stable home for your foot but also provides soft cushioning and shock absorption. There is also a foam insert on top of this that will add comfort whether you leave it in or replace it with a custom orthotic. Verdict:This pair does have two different things to look at before you buy it. First, the toe box is rather roomy width-wise, but it is shallow. This means that people with higher toes may find that their toes rub against the top of the shoe. Second, there is not a great deal of arch support with this shoe. You can, however, fix this by adding your insert. The Men’s Milan Leather shoe is nice enough to be a dress shoe, but comfortable enough that it allows you to walk with a natural gait. It features a flat outsole that helps propel you forward and provides stability. There is also an internal control plate that helps stabilize the foot. Finally, the EVA midsole reduces the force of impact, which is an important feature. Something to consider about this shoe is the width. It is rather wide in its standard size, which is good for some people but not for others. It also may be too rigid for your individual preference. Verdict: If you have wide feet and rigidity is not an issue, then this is an excellent shoe. It is comfortable and stabilizing, like a sneaker, but looks like a dress shoe. This dress shoe comes with a lot more cushioning than most dress shoes. It also features a thick, 1 ¼” outsole that provides additional cushioning and absorbs impact. Finally, the rounded toe area is roomy and comfortable for most wearers. There are a few factors to be wary of before buying these shoes. First, the back of the shoe is rather stiff and it may cut into the heel if you wear it without socks. The shoe also does not have enough arch support, but there is room for an insert. Finally, some people find the shoe too rigid despite the shock absorption and it can make Achilles Tendonitis worse for some wearers. Verdict: With shock absorption and comfort, this shoe is top-of-the-line as a dress shoe. It does have a few features to be cautious of before buying, like the arch support and the rigidity of the shoe. The GEL-Blur33 shoes have many features that make them especially comfortable. First and foremost, there is gel cushioning in the heel of the shoe that adds comfort and shock absorption to limit the impact. Another feature to mention is the removable insert, which adds comfort on its own but can also be replaced with your insert. Finally, the secure lacing system and mesh upper offer a breathable, but secure fit. Two things to consider are the toe box and the arch support. The toe box is very large, which is an advantage for some people. Others, however, may find that their toes slide. There is also not a lot of arch support in these shoes, but you can fix this with an insert. Verdict: As long as your toes do not slide around, this shoe is perfect. It offers support and comfort in all of the areas that you need it in when you have this condition. They have a few benefits. First, there is an EVA foam footbed that stabilizes the foot and absorbs the impact when you walk or run. This insert is also removable, which allows you to add your own insoles if you choose. This shoe offers great arch support and bends with your natural step, making them comfortable to wear. Before you buy these shoes, know that they do run narrow. However, they do come in wide sizes. The quality is also not the best in every shoe manufactured- be sure to check who is making them before you buy them online! Verdict: When purchased from a reputable manufacturer, these shoes are an excellent choice. They stabilize your foot and absorb impact, two features which are important for people suffering from the ruptured tendon. They do run narrow, so consider a wider size if you have wide feet. So, what is the final verdict? Here are the best shoes for Achilles Tendinitis for men and women, as well as a few of the reasons that these two pairs of shoes were named the best. This shoe is named best because of the Infinity Wave plate that makes walking and running an absolute delight when you suffer from calf muscle pain. It is very flexible but still provides the stability you need to hold your foot in place. As long as the toe box is a good fit for your foot, these shoes are an excellent choice. This shoe is the best for women because of the ABZORB Strobel Board that absorbs impact while cushioning your foot. It is also flexible but provides a stabilized, solid fit. Finally, the mesh design and lacing system allows it to fit a wide range of feet. It may be lacking in arch support for some wearers, but this can easily be fixed with the right insert. If you find that any particular shoe does not feel right, try another. Remember that every foot is unique, especially when you suffer from Achilles Tendonitis or other orthopedic problems.